Waiting for Gilad – On the foggy morning of June 25, 2006, a cell of terrorists penetrated into Israel, near Kerem Shalom. Lt. Hanan Barak from Arad and First Sergeant Pavel Slocker from Dimona were killed in an exchange of fire between IDF troops and Hamas militants. Corporal Gilad Shalit from Mitzpe Hila in the Galilee was kidnapped and taken into the Gaza Strip. Ever since that day, no one – aside from his captors – has seen Gilad face-to-face. In the five years that he has been held captive in Gaza, the only signs of life his family received were one videotape, one audiotape on the first anniversary of his abduction and several letters that were transferred to Israel by Hamas. After the abduction, the IDF launched Operation Summer Rains. Then Prime Minister Ehud Olmert said the following day: "We will not concur Gaza, and will not negotiate with the kidnappers." Several days later the Prime Minister's Office stated that "there will be no ceasefire without the release of the soldier." This operation, like many others that followed, ended without Gilad being freed. On September 2006, about three months after the abduction, Israel received the first sign of life in the form of a letter written by Gilad. In mid-September a Saudi paper reported that Israel and Hamas were very close to signing a prisoner exchange deal that would free Shalit. This report, like the countless reports that followed never amounted to anything more than a piece of paper. On June 2007, exactly one year after the kidnapping, Hamas released an audiotape recording with Gilad's voice. "I am Gilad, the son of Noam Shalit, who is held captive by the Mujahedeen. Mom and dad, my sister and brother, my friends in the IDF. I send you all my regards and am longing to see you," Gilad was heard saying. In February 2008 a second letter was transferred by Hamas. The third letter was received four months later. The note with Shalit's handwriting was handed to his parents as part of Hamas' obligation to former US President Jimmy Carter, who visited the area at the time. The message on the note was clear: "I beg of you to release me." On July 22, 2008 Shalit's friends were released from the IDF – three years after they joined the Armored Corps. Later that day they marched to the Defense Ministry in Tel Aviv and met with Defense Minister Ehud Barak, who told them: "As an army commander past and present, I see it as a moral duty to do anything possible to bring Shalit home." The most salient military operation since the Gilad's abduction was Operation Cast Lead, launched in December 2008. As IDF soldiers entered the Strip, they vowed not to leave without Gilad, but the operation ended with Shalit still captive. 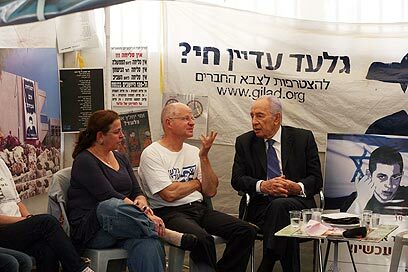 The next public campaign launched just before Gilad was about to mark 1,000 days in captivity, was a protest tent erected by the Shalit family outside the prime minister's residence in Jerusalem. Ministers, Knesset members, public figures and ordinary citizens visited the tent to express their support. At the time, a prisoner exchange deal seemed closer than ever. The prime minister's special envoy to the talks, Ofer Dekel, and then Shin Bet Chief Yuval Diskin held negotiations with Hamas, with Egypt acting as a mediator. But hope turned into disillusion once again. PM Ehud Olmert explained the deal was foiled because "Hamas hardened its position, went back on previous understandings and presented extreme demands." On October 2, 2009 – after 1,195 days in captivity, Gilad's face was seen for the first time. Hamas handed Israel a videotape showing Gilad alive and in relative good health as part of a deal that saw the release of dozens of female Palestinian prisoners. In the tape, which was recorded several weeks prior to its release, Gilad is seen walking around and holding a recent newspaper. He then sends his regards to his family and asks once again that the government of Israel meet his captors' demands. Several days after Gilad's fourth anniversary in captivity, the Shalit family left their home in Mitzpe Hila and began marching by foot to Jerusalem. 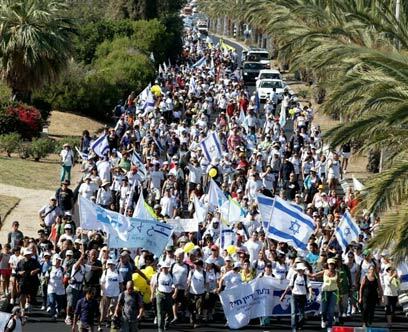 Tens of thousands of Israelis joined them along the route, including Rona Ramon, who lost her astronaut husband Ilan and pilot son Assaf. Defense Minister Ehud Barak's wife Nili Priel also joined the march as it passed through Tel Aviv. After 12 exhausting days, the captive soldier's parents arrived in Jerusalem and set up a protest tent in front of the prime minister's residence. Since last summer, Noam and Aviva Shalit have met with Prime Minister Benjamin Netanyahu several times, and continue to protest every Sunday along with activists from the campaign to release Gilad in front of the government building, where weekly cabinet meetings are held. As part of the family's efforts, Noam Shalit also tried addressing the Palestinian side. Ahead of the month of Ramada, Shalit held a press conference with an Arabic translator by his side. He called on the Palestinians to join the efforts to renew negotiations for a prisoner exchange deal. "Increase the pressure on your leaders just as we have done," he said. 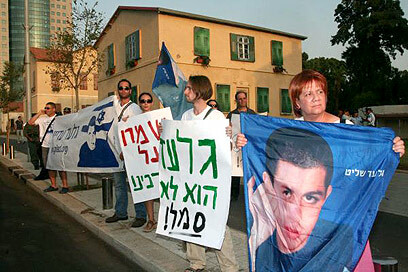 On August 28, 2010, the Shalit family marked Gilad's 24th birthday – his fifth in captivity. 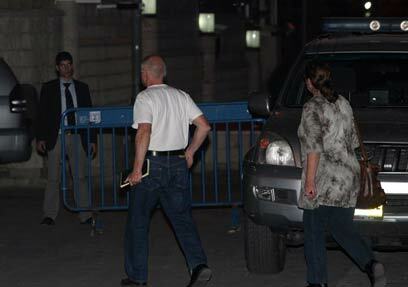 Aviva Shalit, speaking in front of the prime minister's residence, addressed her captured son: "Today is your birthday. This year, again, I didn’t buy you a gift, or bake you a cake, and you can't blow out the candles and make a wish. "Giladi, can you hear me? 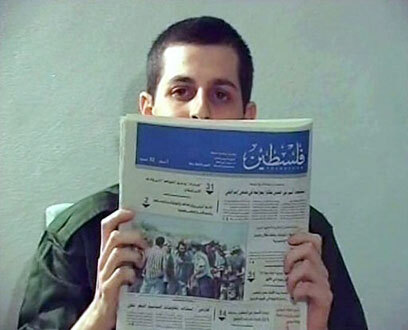 Do you know that an entire country followed us in the struggle for your release," Shalit said. Ahead of Yom Kippur, Gilad's grandfather sent a letter to Netanyahu, reminding him that his son fell during the Yom Kippur War. "Gilad's fate does not have to be similar to my son Yoel's fate," he wrote in the letter. On March 15, 2011 an entire country stood in silence for five minutes – a minute for every year Gilad has been in captivity. Activists and supporters blocked roads and stopped traffic as they tried to raise awareness for Shalit's cause. The Shalit family's protest reached its peak during the torch-lighting ceremony on Israel's 63rd Independence Day, when Gilad's brother, Yoel, and girlfriend Yaara Winkler walked onto the ceremony grounds and waved signs reading "Gilad is still alive." They were escorted out by security officers. Moments after being escorted out of the ceremony, Yoel Shalit told Ynet: "I'm here because after five years its time to return Gilad who is in a pit in Gaza right now, and doesn’t see the light of day. He can’t shout and that's why I'm here to shout for him." In recent weeks media reports surfaced again, claiming that the sides are close to reaching a prisoner exchange deal whereby Israel will release hundreds of prisoners in exchange for Gilad. However, like previous reports, rebuttals were issued shortly after. Last Friday, French President Nicolas Sarkozy and German Chancellor Angela Merkel both issued calls for the release of Shalit. "We are announcing that this is a very important matter," Merkel said after meeting with Sarkozy. Sources from the chancellor's office say a draft of a final agreement for Shalit's release prompted the statement. 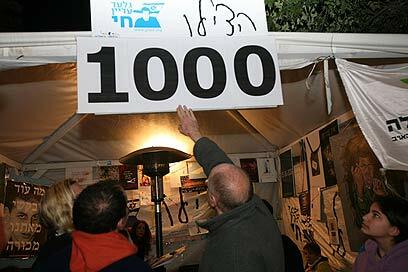 According to the draft, 1,000 Palestinian prisoners will be handed over in exchange for the IDF soldier. However, Hamas's military wing has vetoed the proposal, according to the sources. See all talkbacks "Life between hope and despair"